The Skinny: Pretty and puzzling. This mystery-romance has style to spare, but also a lack of satisfying content to make it worthwhile. An intriguing and unfulfilling exercise in neo-noir expressionism. If that's your boat, maybe M will float it. M is pretty and puzzling. Director Lee Myung-Se (Nowhere to Run, The Duelist) helmed this mystifying film noir, which introduces many hallmarks of the genre, revealing them in an unpredictable manner before finally resolving everything with a resounding, "Ummm...yeah, so?" At least the film is pretty, and by pretty, we mean really, really pretty. No stranger to stylistic excess, Lee pulls out all the stops for M, using light, shadow, varying film speed, abundant voiceover, and more affected storytelling than should probably be allowed in any commercially-released film. M is an attempt at art, and the ability of the audience to enjoy it depends largely upon their acceptance of form as more vital than content. Lee uses his form powerfully; M is a treasure trove for fans of expressionism, who can dissect the film's composition or mise en scene until their frontal lobes bleed. However, Lee doesn't use his content quite as well. The film's journey is so alienating that felt emotion is hard to come by, despite whatever the characters may be trying to sell. For some audiences, confused irritation is also a possibility. Kang Dong Won is Min-Woo, a bespectacled writer who can't seem to get his new novel in gear. At the same time, his marriage to Eun-Hye (Kong Hyo-Jin) seems to be suffering slightly, as he's concentrating heavily on his new novel, and seemingly ignoring her. However, something else is nagging at him: Mi-Mi (LeeYeon-Hee), an adorable beauty who is first seen talking of her love for the frazzled Min-Woo, who she tails from place to place, quietly and just out of sight. Her stalking technique is pretty damn good, because Min-Woo never seems to notice that she's there. However, he actually is aware of her presence - but only peripherally. She seems to be haunting him from the edges of his consciousness; it's like she's always there, but she's also not, tugging at the corners of his memory, and making his daily life a surreal, dreamlike haze. When the two do finally make some connection, the question must be asked: are the two really seeing one another? Or is the meeting of Min-Woo and Mi-Mi just a remnant of memory, or worse, a precursor to madness? And why can't anyone buy a brighter lightbulb? 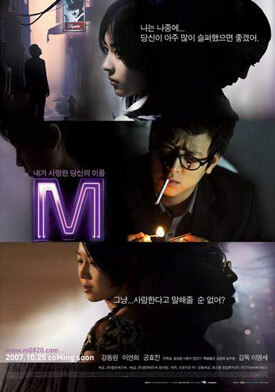 Style qualifies as substance in M. Or, at least Lee Myung-Se seems to be attempting that hallowed cinema trick. To the director's credit, he gets tremendous mileage out of his style, using fleeting figures, obscuring shadows, copious visual metaphor, and existential voiceover to bring the audience into his characters' trippy, confused world. The first half-hour of the film is exceptionally disorienting because it doesn't introduce as much as throw the audience into the deep end of the pool, expecting them to sink or swim automatically. Those who can swim (a.k.a. willing cinema readers, or super fans of expressionism) may enjoy Lee's stylistic assault. The film asks audiences to observe and perceive, piecing together emotions and various clues in order to find the truth behind what's happening onscreen. Is everyone in the film alive? Are we witnessing the imaginings of an unreliable narrator? What memories are being uncovered by Minwoo's unrelenting, unconscious search? Lee raises many questions visually and emotionally, using the full complement of filmmaking powers to intrigue and involve his audience.